Normally for our featured author post, Book Worm and I feature an author we have both read and then we list our favorite books from that author. This month we thought we’d do something a little different and explore the life and works of the most recent winner of Nobel in Literature: Svetlana Alexievich. Svetlana is a Belarussian journalist and prose writer. She is only the 14th woman to ever win the Nobel prize and one of only a handful of non-fiction writers. 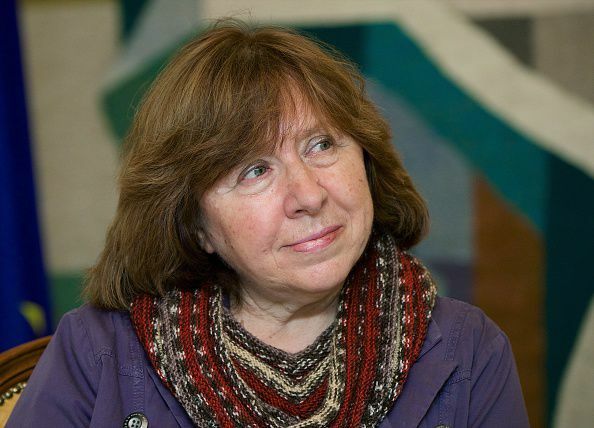 Ms. Alexievich’s works have been described as “narrative non-fiction” and are known for giving voice to those who are not frequently featured in historical accounts. She has extensively researched the role of women in the front lines, interviewing over one hundred women who fought for the Soviet Union in World War II for her book “The Unwomanly Face of the War“. I’ve been searching for a literary method that would allow the closest possible approximation to real life. Reality has always attracted me like a magnet, it tortured and hypnotized me, I wanted to capture it on paper. So I immediately appropriated this genre of actual human voices and confessions, witness evidences and documents. This is how I hear and see the world – as a chorus of individual voices and a collage of everyday details. This is how my eye and ear function. In this way all my mental and emotional potential is realized to the full. In this way I can be simultaneously a writer, reporter, sociologist, psychologist and preacher. [excerpt from her website]. Svetlana was born in Ukraine in 1948 to a Belarussian father and Ukrainian mother. She studied journalism in college and worked for a newspaper in Brest where she started experimenting with oral history of individuals who were at the center of historic events. She was quickly promoted and eventually took on the job of a correspondent for a literary magazine, Neman where she became the head of the non-fiction section. Over the course of her career she has written short stories, essays, journalist pieces and a variety of non-fiction books. I don’t just record a dry history of events and facts, I’m writing a history of human feelings. What people thought, understood and remembered during the event. What they believed in or mistrusted, what illusions, hopes and fears they experienced. This is impossible to imagine or invent, at any rate in such multitude of real details. We quickly forget what we were like ten or twenty or fifty years ago. Sometimes we are ashamed of our past and refuse to believe in what happened to us in actual fact. Art may lie but document never does. Although the document is also a product of someone’s will and passion. I compose my books out of thousands of voices, destinies, fragments of our life and being. It took me three-four years to write each of my books. I meet and record my conversations with 500-700 persons for each book. My chronicle embraces several generations. It starts with the memories of people who witnessed the 1917 Revolution, through the wars and Stalinist gulags, and reaches the present times. This is a story of one Soviet-Russian soul. Voices from Chernobyl: The Oral History of a Nuclear Disaster (Amazon synopsis): On April 26, 1986, the worst nuclear reactor accident in history occurred in Chernobyl and contaminated as much as three quarters of Europe. Voices from Chernobyl is the first book to present personal accounts of the tragedy. Journalist Svetlana Alexievich interviewed hundreds of people affected by the meltdown—from innocent citizens to firefighters to those called in to clean up the disaster—and their stories reveal the fear, anger, and uncertainty with which they still live. Comprised of interviews in monologue form, Voices from Chernobyl is a crucially important work, unforgettable in its emotional power and honesty. Zinky Boys: Soviet Voices from the Afghanistan War (Amazon synopsis): From 1979 to 1989 a million Soviet troops engaged in a devastating war in Afghanistan that claimed 50,000 casualties―and the youth and humanity of many tens of thousands more. Creating controversy and outrage when it was first published in the USSR―it was called by reviewers there a “slanderous piece of fantasy” and part of a “hysterical chorus of malign attacks”―Zinky Boys presents the candid and affecting testimony of the officers and grunts, nurses and prostitutes, mothers, sons, and daughters who describe the war and its lasting effects. What emerges is a story that is shocking in its brutality and revelatory in its similarities to the American experience in Vietnam. The Soviet dead were shipped back in sealed zinc coffins (hence the term “Zinky Boys”), while the state denied the very existence of the conflict. Svetlana Alexievich brings us the truth of the Soviet-Afghan War: the beauty of the country and the savage Army bullying, the killing and the mutilation, the profusion of Western goods, the shame and shattered lives of returned veterans. Zinky Boys offers a unique, harrowing, and unforgettably powerful insight into the realities of war. Chtenia 08: Love a la Russe (Chtenia: Readings from Russia, 8) (Amazon synopsis): There are many types of love, and sometimes they assume a form that is not immediately recognizable… This Chtenia collection brings together wonderful stories by authors such as Anton Chekhov, Elena Makarova, Aleksandr Solzhenitsyn, Maria Galina, Svetlana Alexievich and more. If you want to understand Love from the Russian worldview, there is no better place to start. What do you think of her work? Have you read any of her books? Would you like to read any of them? I am not a big reader of non-fiction, but her works sound interesting so I have just purchased Voice of Chernobyl. Jen, do you know which language she writes in? Given her background and the topics of her books, I would imagine Russian.